Is you bring to the light of day, stuff you forgot about. Like a big ball of some novelty yarn.. 2 strands of fine cotton(?) 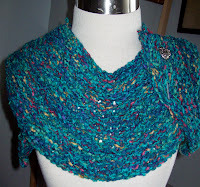 well cotton-ee boucle, one navy one, turquoise, together with a 3rd strand of multicolor chenille(cotton, too? I dunno, maybe cotton or maybe rayon). All three together creating a slight bulky weight yarn. It came to me, unlabeled from the remnants of my mothers stash.. A stash that had both Noro yarn, and Red Heart –a real mixed bag of yarns! Well this is what I did with it. 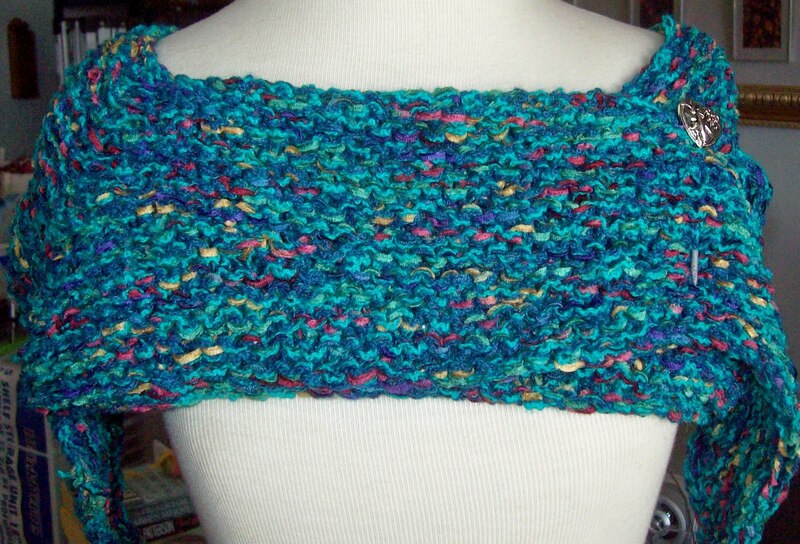 A giant C shaped scarf. It can be worn with the center in front, and the ends wrapped and pinned. Or with the center to the side, and ends over lapped on the other side an pinned, or with the center in center back—and wrapped another way. There is no wool in it—it might be cotton, it might be cotton and acrylic, or cotton and rayon, or who knows what! Does it matter much? Well, only when it comes to washing! It's not a scarf for warmth—but is is not un-warm.. It's more of a bit of panaché—and its another bit of stash relocated. Oh, yeah—I got this knit.. but no candy corns! Looks nice, the corn will come!